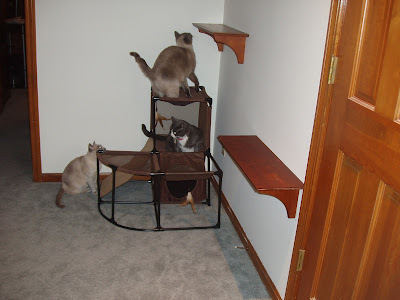 A Tonk's Tail... err, Tale...: Our Pawesome New Jungle Gym! 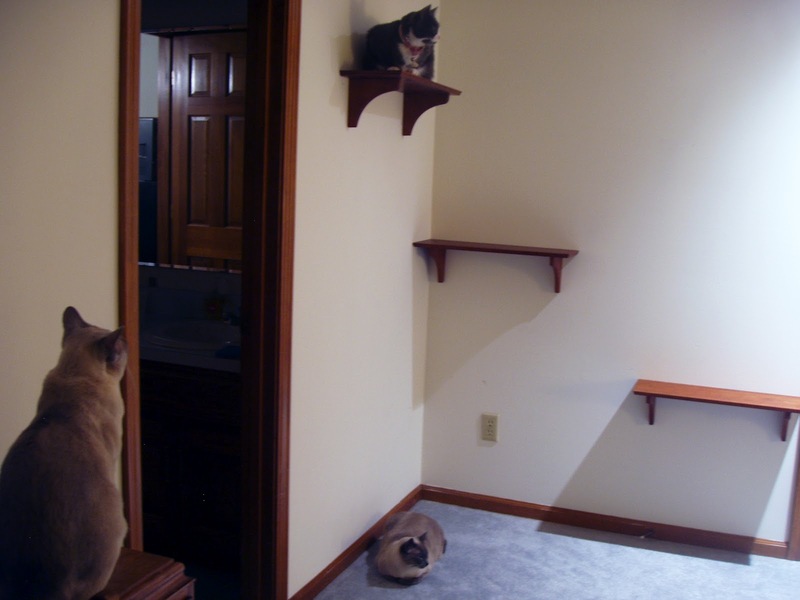 so they installed this pawesome Super Highway in the guest bedroom! Faraday: of course, I had to try it out first! And then they brought up our condo! SCORE! Can you please tell our Daddy how much you LOVE your new pawsome Super Highway? Since watching My Cat From Hell, Mommy's been bugging Daddy to install it for us but Daddy isn't so sure we'll use it. oh we love it! It's almost as much fun as Da Bird! Oh wow! I'm gonna go have a little chat with my peeps about this right away. It looks amazing!!! Awesome! Can we come over and try it out? We'll tell Mommy to load up the blender for catnip smoothies! Come on over! Wowee! You're going to need to send your daddy over here to do that! I've been after our daddy to put those in forever! Have fun you guys, that looks pawsome!! We love it! Come over and visit! That is so darn cool and sure looks like lots of fun! You look like you are having so much fun!!! Your Mom and Dad are cool! 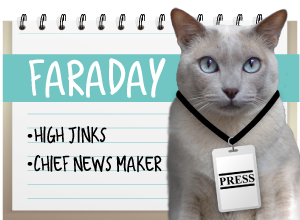 FaRAdaY: I see a money-making venture in my future! I canz rent Daddy out and make myself TONS of those green paper thingys and...and... BUY WAND TOYS!! Wow! Pretty soon you guys will be like the Katnip Lounge Kids and their Catio. My Human has no skills and no plants to acquire any. Sigh. I'm lucky I have my one little kitteh tower by the window. I want a superhighway, dammit!!! Uh, make that "plaNs" ha ha meow! I hope you don't mind I call you Max...I came over from Sandi photo hunt and I believe your one spicy guy. I have to say I never seem so many neat things for cats...coffee is on. 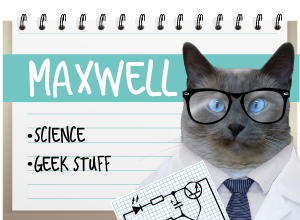 Maxwell: *bluuuush! * aww, gee, thanks Dora! 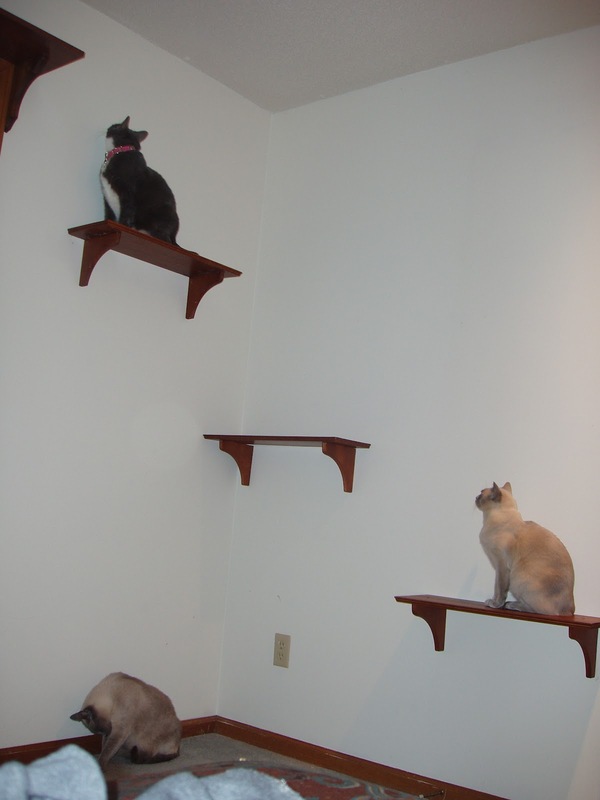 Wait, there is a Meezer ON THE FLOOR when there are heights to be climbed? That worries me. Ayla, we think it's because Maxie's hearing impaired. He's awfully careful when he jumps on things - he gauges the height very carefully before making the leap! Wow I. want. One. Of. Those. Wow! Those shelves are awesome! We've been asking our mom to do something like that but she's not very handy. Maybe she should hire your Daddy! FaRADaY: Will Ship for WAND Toys! OMC! That is BEYOND awesome!!!! 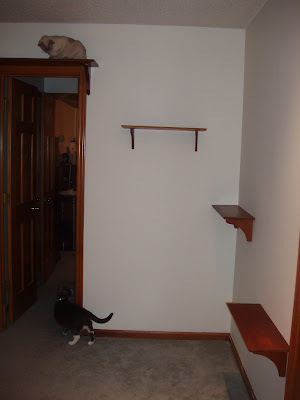 I bet you guys will have so much fun with these new shelves! Score indeed! How did yous wrap your pawrents around your paws to get them to do that!?! Me would LOVES something like that at our house. Does yous guys want another cat? 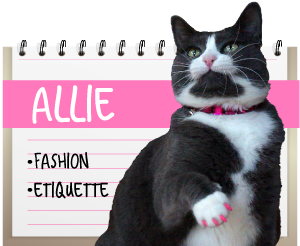 Allie: Nellie! Come on over! I'm outnumbered over here and could use a girl backup! OMC! Those are pawsitively pawsome! You need to haf the Dad to carpet them so you will haf a little traction! Wow, that is so cool! I bet you kitties will be spending lots of time there! ME TOO WANT´s a djungelgym !!! Very cool! Thanks for sharing will have to rig up something similar when we get our next kitty.